It should be said that in recent years women have began to press out the men's positions in card games - on tournaments and events women's names appear more and more often. Looking at the photo of Vanessa Rousso, a man can hardly even think that this Barbie-like blonde is one of the most dangerous poker players on Earth, and one of the chief members of best-known poker sites, which sponsor her for participating in poker events. Though she is not a member of a legendary Blackjack Hall of Fame, she is clever and smart enough to make a career on that very activity which she likes most of all. Vanessa was born in White Plaines, New York, in 1983. Her father was a French citizen and till the age of 10 she was raised in France. But further her family moved back to the United States and fist she lived in New York, and afterwards in Florida - there Vanes attended her high school. She graduated from the Duke University with honors of full scholarship and proceeded to law school in Miami. Vanessa wanted to become a securities litigation expert, but this desire flew away as soon as she got acquainted to poker. But before she was interested in Game Theory - a subject which taught applying complex mathematical theories in everyday life. Besides, she liked games from her childhood and that's why in 2005 she started her professional poker career. She started from video poker, then switched to online one and proceeded with tournaments and professional playing. When she understood that her talent was hidden not in studies and securities litigation, she left the high school and came to card games face to face. 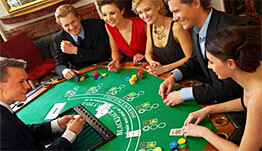 Starting from poker and blackjack in casino, she switched to online card gaming. Now she plays exclusively for PokerStars team, which is probably the most well-known online resource concerning poker. In a year from the beginning of her gambling career she won a $250.000 prize, having got 7th place in World Poker Tournament Championship. In 2007 year she walked away with $700.000 prize and the 2nd place, and that was one of the record winnings in the history of online poker. In fact, Vanessa is not only a fascinated poker player and one of the top blackjackfemale players without other interests. When asked she describes herself as an extremely active woman, who likes skydiving and bungee-jumping. Also, in free time she manages to write articles and developing strategies concerning poker and blackjack for online resources.